CD review: "Old School, Nu School"
This review first appeared in the October 16, 1992 issue of the North County Blade-Citizen (now North County Times). 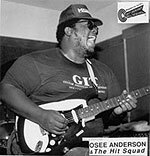 Now based in Orange County, Anderson is a familiar face on the Southern California blues scene with his band, Hit Squad. His debut solo effort, "Old School, Nu School" on his own Integrity Records, showcases an artist who has progressed beyond the adolescent thrill of seeing how fast he can play. A gifted vocalist as well as guitarist, Anderson also shows a touch as composer, writing or co-writing almost all of the tunes here. His guitar playing couples a tasteful restraint to his incredible ability, leading to some outstanding solo passages (with a highlight-film caliber run on "Can't Miss What U Never Had"). On "Old School, Nu School," Anderson's self-styled "bluesion for the '90s" ranges from the funk of "How Long (Will This Pain Last)" through the straight-ahead blues of "10:00 News Bleuz" to the New Orleans street jazz of "Rampart Street Strut." The points at which "Old School, Nu School" falters are those where Anderson's "bluesion" sounds too much like late-'70s fusion, or light jazz. This is particularly true on "Paycheck to Paycheck," which starts off strong with Anderson's slightly nasal tenor vocals before bogging down in keyboardist Bobby West's Fattburger-like pop jazz leads. Drummer Larry Washington lends his vocal talents to his own "How Long," while Anderson and harp player Morris Evans share the rest of the vocal duties. Anderson's vocals aren't as smooth as Evans, and the two tunes he sings are are the bluesiest of the bunch. But these are minor complaints against what is a very good first album.